One of the biggest challenges for internet marketers is that the standards change constantly. What may have been a legitimate SEO practice in the past may no longer be acceptable. Earlier this year, Google made changes to Penguin, the current iteration of its search algorithm, that penalizes certain tactics like using paid link networks. A recent bust by Google illustrates the importance of ensuring your site is using up-to-date tactics. At the beginning of December, Google’s head of spam tweeted that the company was targeting a private link network called Anglo Rank that offered paid links that would boost search engine results. “‘There are absolutely NO footprints linking the websites together’ Oh, Anglo Rank,” tweeted Matt Cutts, mocking the advertising pitch Anglo Rank used on a site called Black Hat World (which is probably not a good idea to use). Despite what some black hat SEO marketers say, Google is able to track link networks and they will penalize sites that use these techniques. In a video published back in May, Cutts said that Google plans to move “upstream” in its fight against spammy links. Back in June, a service called “Text Link Ads” was targeted by Google and thousands of sites saw their rankings drop as a result. In September, Google took down Ghost 2.0 link network from Russia. The comments from users on BlackHatWorld showed how damaging it can be when a site that is listed on one of these networks is effected. The way Google is handling link networks illustrates the danger of using any form of black hat SEO. Even if search engines are unaware of an unethical SEO tactic at the time, they will eventually learn of it and penalize the sites that use it. 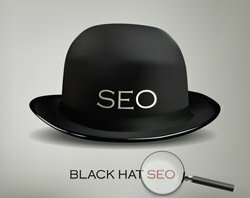 This makes using black hat SEO the equivalent of resting a valuable vase on a house of cards. Even if looks sturdy at the moment, eventually a wind will come along and knock it down. The final takeaway from the recent news involving the Anglo Rank network is that marketers need to keep up with the latest in SEO. The people who were affected by the most recent crackdown had plenty of opportunities to reverse course since the trend of tougher enforcement on paid link networks had been clear for a while now. The surest way to boost search engine results will always be based on preparing good content and having relevant links that are being clicked on by people online. Marketing firms that promise to boost search engine result placing through other methods are possibly doing something that could hurt SEO efforts down the road.